In this study, we analyse the uncertainty of the effect of enhanced greenhouse gas conditions on windiness projected by an ensemble of regional model simulations driven by the same global control and climate change simulations. 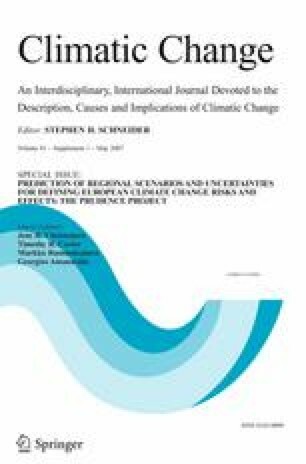 These global conditions, representative for 1961–1990 and 2071–2100, were prepared by the Hadley Centre based on the IPCC SRES/A2 scenario. The basic data sets consist of simulated daily maximum and daily mean wind speed fields (over land) from the PRUDENCE data archive at the Danish Meteorological Institute. The main focus is on the results from the standard 50 km-resolution runs of eight regional models. The best parameter for determining possible future changes in extreme wind speeds and possible change in the number of storm events is maximum daily wind speed. It turned out during this study that the method for calculating maximum daily wind speed differs among the regional models. A comparison of simulated winds with observations for the control period shows that models without gust parameterisation are not able to realistically capture high wind speeds. The two models with gust parametrization estimate an increase of up to 20% of the number of storm peak (defined as gusts ≥ 8 Bft in this paper) events over Central Europe in the future. In order to use a larger ensemble of models than just the two with gust parameterisation, we also look at the 99th percentile of daily mean wind speed. We divide Europe into eight sub-regions (e.g., British Isles, Iberian Peninsula, NE Europe) and investigate the inter-monthly variation of wind over these regions as well as differences between today’s climate and a possible future climate. Results show differences and similarities between the sub-regions in magnitude, spread, and seasonal tendencies. The model ensemble indicates a possible increase in future mean daily wind speed during winter months, and a decrease during autumn in areas influenced by North Atlantic extra-tropical cyclones.